John C. Seivert, PT, DPT, FAAOMPT, CSCSA 1984 graduate of Northern Arizona University, John went on to complete the Graduate Diploma in Manipulative Therapy (GDMT) in 1991 and a Masters in Physiotherapy in 1996 from Curtin University of Technology in Perth, Australia. He is a Fellow of the American Academy of Orthopaedic Manual Physical Therapists (FAAOMPT) and a member of the American Physical Therapy Association (APTA), the Institute for the Advancement of Orthopedic Physical Therapy (IAOPT), and the National Strength & Conditioning Association (NSCA). 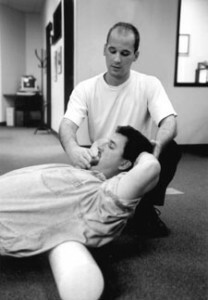 Since 1991, John has taught Manual Therapy Courses to physicians and other medical professionals around the nation and world. He is the owner of Body Logic Physical Therapy in Grass Valley, California. Matthew graduated with his Masters in Physical Therapy degree from the University of Utah in 1999. He worked in diverse patient treatment settings, including outpatient orthopedics, neurological rehabilitation, acute care, and wound care prior to specializing in orthopedic and manual physical therapy. He participated in three year-long manual therapy courses and acquired training in Australian, Norwegian, McKenzie, and Osteopathic approaches. In 2003 he was board certified as an orthopedic clinical specialist (OCS) by the American Physical Therapy Association. In 2004, Matt underwent training at the prestigious Kaiser Hayward Fellowship in Orthopaedic Manual Physical Therapy. He is a member of the APTA and American Academy of Orthopedic Manual Physical Therapists.